Skydive Tecumseh is the closest skydiving center to Ann Arbor, Michigan. Since moving from Tecumseh to Jackson (at the Napoleon Airport), we are now an easy 40-minute drive down I-94 West. Located just 32 miles west of downtown Ann Arbor MI, Skydive Tecumseh is Michigan’s premier skydiving center. Established over 50 years ago, Skydive Tecumseh has been offering Michiganders (and our neighbors) world-class skydiving experiences. Our drop zone is synonymous with Michigan skydiving. 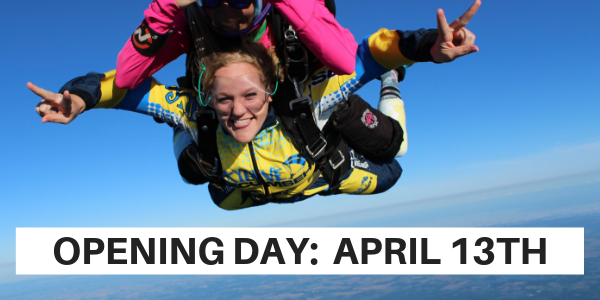 We are the #1 choice for skydiving near Ann Arbor, Michigan! It doesn’t matter who you are… you’re important to us! Whether you’re making your first jump or your 10,000th, our goal is to ensure everyone has an absolute blast. Our team of instructors and coaches are committed to help everyone advance while having a good time. You’ll notice that we’re not the least expensive skydiving center in the market and there’s a reason for it. Our goal is to assemble the best team possible while maintaining our equipment and aircraft with excellent facilities. If you’re looking for a great experience as opposed to just a skydive, we hope you’ll choose us. Skydive Tecumseh is a full-service skydiving center offering tandem skydiving, learn to skydive programs (AFF and IAD) as well as events and skills camps for experienced skydivers. We have been operating for more than 50 years and have gained the reputation as being the premier skydiving center in Michigan. If you live in the Ann Arbor area and you’re ready to take the leap, give us a call or book your skydive online today! We’re open for jumping Wednesday-Sunday, year-round.